On Tuesday, artist Jason Rouleau and his team from MuralForm will arrive at St. Andrew’s Presbyterian Church and begin painting colourful flowers, vines, leaves, and animals on the church’s north wall. In Prince Edward County with its bustling art community it might be easy to dismiss their work as yet another arts installation, but pastor Lynne Donovan is hoping this work is looked at differently. That’s why the church didn’t choose a county artist for the installation. 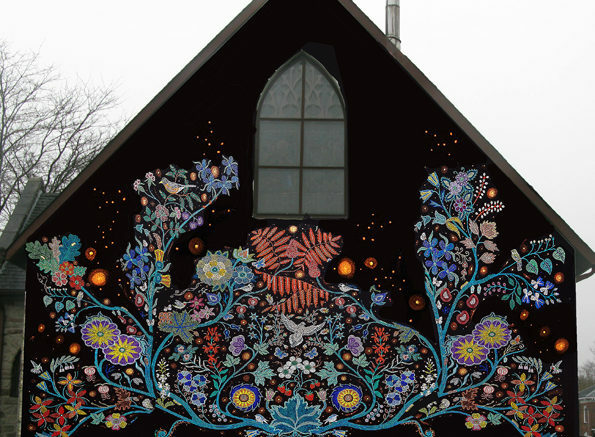 The mural is “Wisdom of the Universe”, a piece by award-winning Metis artist Christi Belcourt. It hasn’t just been chosen to brighten up the neighbourhood, but instead to provoke discussions and action. The pastor is talking about residential schools and the systemic effort by government and churches to remake Indigenous peoples with a different value system, rather than accepting their own. Through the work of the Truth and Reconciliation Commission, which reported on those actions in 2015 with a number of calls for action, Donovan said the country has been examining its role in that annihilation of a culture and consider a new path. The Presbyterian church, like other mainline denominations, was involved in that course of action. “Our denomination, like all the other denominations has made apologies, but now we’re called to take steps. The first step is to give the largest canvas our building has to offer to an Indigenous artist so to speak from an Indigenous perspective,” she said, adding deliberations of what could be done were challenging, but congregants believed they needed to do something with humility and respect. After struggling with the enormity of that history, Donovan said members of the church decided to reach out to Belcourt to see if she would give permission for her work to be used. It was the first piece that came to mind as is speaks directly to a wisdom that has been present in Indigenous culture. A dedicated activist who was commissioned by the Canadian government to design a stained glass window on Parliament Hill depicting the country’s apology to its First Nations, Belcourt granted permission for use of “Wisdom of the Universe.” She did not charge a fee for her work. Instead, she invited St. Andrew’s to make a donation to the Onaman Collective, an initiative she started with two other Indigenous artists for the sole purpose of reconnecting Indigenous youth with their language, culture, and sacred practice. The community has provided funds to do that and to install the mural. When Rouleau and his team go to work from Oct. 9-16, they will be painting a piece that is 37 feet tall by 36 feet wide. It will wrap from the north side of the church onto the west side and feature some of Belcourt’s artist statement. It discusses over 200 plant and animal species in Ontario that are endangered by human activities and names seven of them. Donovan hopes it will start a conversation not only about reconciliation with Canada’s First Peoples, but also one about restoring a sacred relationship with the earth. Eventually, the congregation hopes to add information about those species and apply for grant funding for a special curriculum for local school children tied into the work. An interpretive walk may also be in the offing. Meanwhile, St. Andrew’s will be exploring the theme of reconciliation throughout October. Rebecca Maracle, Janice Brant, Steven Loney and Doug Brant, artists from the neighbouring Tyendinaga Mohawk Territory, will speak on Sundays and show their art inside the sanctuary throughout the month. Donovan hopes the work outside will serve as a catalyst to invite people inside to learn about their culture. Already the project has received great community support. Benjamin Moore is providing paint, a Belleville Caterpillar dealer offered a discount on a cherry picker, and donations have been offered. Donovan said the church is still looking for $2,000 more and though it has a donor who will give the money, she’s hoping for a collective effort. To donate, contact Donovan at rev.lynne@sympatico.ca or call the church at 613-476-6024.